The underlying Indian stock market growth is fueled by a burgeoning middle class with a voracious appetite for owning stocks. The BSE Sensex is India¨s primary stock index. The Bombay Stock Market has been going for some 140 years (formed 1875) but the Sensex Index of 30 shares was established in 1986 and set its reference value of 100 on a base date chosen to be 1st April 1979. It is now 40 years since the base date and the index stands at over 39,000. For stock investors this represents an annual rate of growth over the 40 years of over 17%. Rather than a measure of – except indirectly – of the economy or industrialisation, I see the BSE Sensex as primarily a measure of the appetite for investing in stocks. As such, it is a phenomenon of, and by, and for, the “middle class”. Much of the growth of the index is thus due to new owners of stocks entering the market. It is thought that India has around 25 million owners of stocks. There are many definitions of the “middle-class”. I find defining the middle-class by the number of households with a disposable, annual income of over $10,000 is probably the best indicator of the number of stock investors. By this measure the number of stock investors is about half the number of such households. Currently – 2019 – the number of such households is about 50 million and covers 120 – 150 million of the total population of 1,300 million. 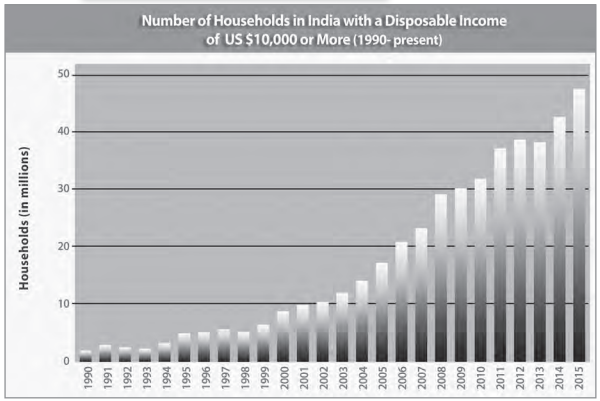 The Indian population will probably reach around 1,500 million and start declining after 2050. It can be expected that the growth of the stock-owning middle-class will keep increasing till then and even for a decade or two after population decline begins. A not-unreasonable projection would be that the underlying growth of the stock index will follow the appetite for owning stocks. The total number of shares available, the number of investors available and the price of the shares are inextricably linked with the state of the economy. An increasing appetite for a fixed number of available shares will follow the number of investors available. This would increase both share price and market capitalisation. However the number of shares available will, given even a modest growth in the economy, probably track the growth in total population. However, the underlying growth over the next 30 years is unlikely to reach the heights of the last 40 years. A saturation law applies and my expectation would be a growth in the index of between 2 and 3 times the current value. Since the number of investors would have grown by a factor of 8 this implies that the total capitalisation of Indian companies on the stock market could be closer to 20 times higher than now. the BJP led alliance (NDA) will get over 280 seats in the Lok Sabha (272 needed for majority) while the Congress led alliance (UPA) will get less than 120 seats. The markets rose over 3% today. Turnout was a record at just over 66% (of an electorate of over 800 million voters). The Indian markets are reacting to rumours and “inside information” as to what the exit polls will reveal when they are published later today. The Election Commission has confirmed that the results of exit polls – which have been carried out over the last 6 weeks of polling and are prepared and waiting to be released – can be released after the polls close at 1830 local time (1500 CET) on the last day of the last phase of voting today. Exit polls don’t have a very good record in predicting the result of Indian elections – especially when they are extrapolated. But we have the peculiar situation of markets being driven by the expectations of what the exit polls will say and where the actual results will not be known till Friday. Capital inflow from overseas has been particularly high and there is a feeling that this cannot be just on the advice of local investors without any special knowledge. There is a suggestion – not at all implausible – that some large investors and their overseas partners may well have carried out their own, private, exit polls. And, the story goes, these show that Narendra Modi and the BJP will get close to an absolute majority. On Friday the BSE Sensex rose over 3% and so far today has risen another 2+% – over 1000 points in a day and a half of trading. It seems that investors are betting that the BJP-led NDA will emerge victorious on May 16, when results are announced, analysts say. “There is a lot of political hope that has got baked in valuations. Markets are factoring numbers close to 230-240 seats for the BJP alone, and if that is the case, the NDA will get a majority on its own. That will lead to pro-growth, right of central, stable formation, which is enthusing for the investors,” said Manishi Raychaudhri, strategist and head of research at BNP Paribas Securities. Polls have consistently shown the BJP and its prime ministerial candidate Narendra Modi ahead, raising expectations that the opposition party, which is seen by markets as being more investor- and business-friendly, will either win or come close to an outright majority. The surprising part, however, is markets seem to be factoring in the best possible scenario (stable government led by Mr Modi) even before exit poll results, due later in the day. One possibility why markets have not waited for exit poll results might have to do with speculation that big investors have already got a whiff of what results would be. In fact, overseas investors bought shares worth Rs. 1,268.78 crore in the cash market on Friday, their biggest purchase since March 28. Friday’s gains came at a time when markets had shed 2 per cent after hitting a record high of April 25. Clearly, smart money had some information. Deven Choksey, managing director of brokerage KR Choksey told NDTV that somewhere from the media, numbers suggesting that the BJP will get 260-270 seats, came out. It was in circulation on social media and markets took advantage of that, he said. The Great Indian Election Tamasha comes to an end on Monday and the results will be announced by the Election Commission on Friday, May 16th. The Indian Stock Exchange (BSE Sensex) is riding very high. On Friday the index reached record levels and rose almost 3%. Business is looking for a stable and effective government. The last term of the Congress led government was one of the most ineffective terms of any government. Not least due to the coalition government which was virtually paralysed in the arms of its many and varied partners. Each of the regional coalition partners were more interested in cashing-in (politically and economically) than in governing or governance. The BJP in opposition was a party of disruption and their objective was to ensure and show that the government was ineffective. Parliament was more often disrupted than in session. Insofar as the Stock Exchange reflects the hopes and predictions of the business community, a Narendra Modi / BJP government is certain. Two years ago I would have thought this was not possible but by December 2012, I became convinced that Narendra Modi would be the next Prime Minister. 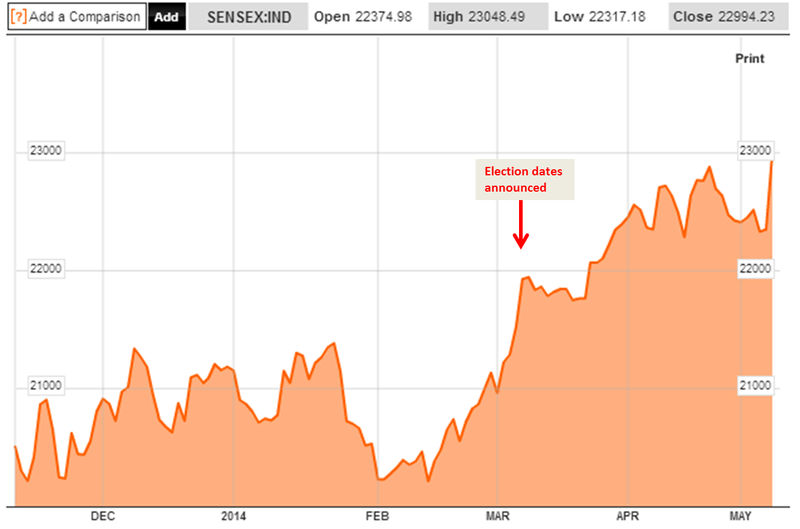 As the election has progressed and the Modi wave has been sustained, the stock exchange has moved inexorably upwards. The new kids on the block – the Aam Admi Party – had threatened to be a spoiler for Modi (and it could still happen) but they are increasingly looking lost. Their leader’s resignation as Chief Minister of Delhi has only strengthened the view that the party lacks substance. They can make a noise and oppose anybody and anything, but they are scared of – and incapable of – governing. Back in February this year it became clear that the election would be held at the end of the government’s mandate in April. The actual dates were announced by the Election Commission on March 7th. The optimism in the markets has grown steadily. Indian business, in my experience, is more concerned about the stability and rationality and continuity of government rather than the manifestos of the various parties. They dislike subsidy policies introduced just to woo voters – but are expert at milking subsidies when available. They prefer the slightly more free-market approach of the BJP and are suspicious of ideological socialism and protectionism. But they have had no difficulty with working with Congress led governments as well. What they just don’t want is another government which cannot overcome the internal strains of a coalition and cannot govern. Uncertainty is the prime enemy. So if the stock exchange is a predictor of the election result then we can expect that Narendra Modi and his BJP will not only win but may even come close to an outright majority. If that happens we can expect a sharp index spike on Monday 19th May – perhaps +4-5%. 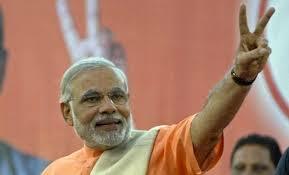 But if there is no overall majority for Narendra Modi, then we could see the markets fall also very sharply. 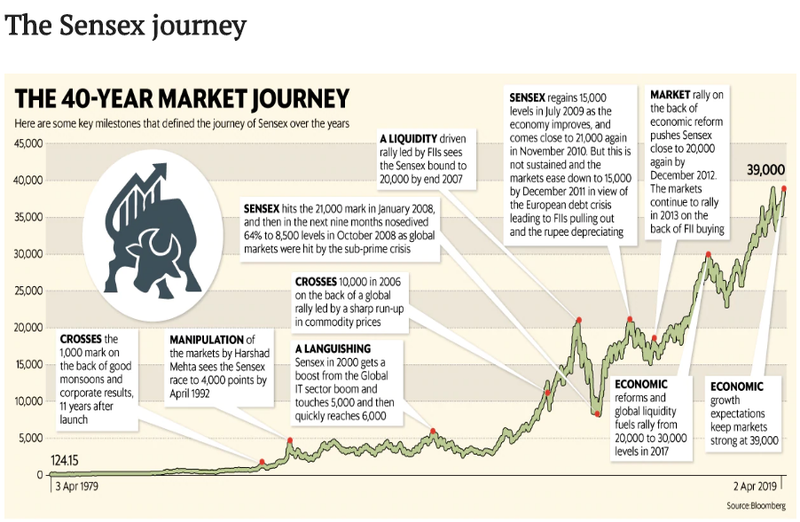 The Sensex reached 23,000 last Friday. By next Friday it could have crept upto about 24,000. Then depending upon Modi’s majority it could spike to over 25,000. But if Modi has no clear majority and another wishy-washy government is in prospect, it could drop to around 22,000 (-10%). Today Indian won the 2nd cricket test against Australia in Bangalore by a handsome 7 wickets. 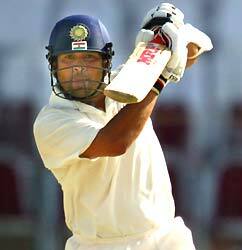 Sachin Tendulkar scored a second innings fifty after his double- century in the first innings which was his 49th Test century. The Bombay Stock Exchange (Sensex) surged 484 points to 20,688 today. This was immediately taken as corroboration of the street wisdom that the two are closely tied. The Indian Express is euphoric. Sensex wins on day of India’s triumph. A superb ending for the stock markets happened in tandem with Team India’s victory against Australia in Bangalore. Coincidence? The 484-point surge in BSE benchmark Sensex today coincided with the triumph of Indian cricket team against Australia –thus corroborating claims of a correlation between trends in stock markets and cricket field. A recent paper by Monash University economists did find a link between Cricket performance and the BSE Sensex. Mishra, Vinod & Smyth, Russell, 2010. “An examination of the impact of India’s performance in one-day cricket internationals on the Indian stock market,” Pacific-Basin Finance Journal, Elsevier, vol. 18(3), pages 319-334, June 2010. This study examines the impact of the Indian cricket team’s performance in one day international cricket matches on returns on the Indian stock market. The main conclusion of the study is that there exists an asymmetric relationship between the performance of the Indian cricket team and stock returns on the Indian stock market. While a win by the Indian cricket team has no statistically significant upward impact on stock market returns, a loss generates a significant downward movement in the stock market. When Sachin Tendulker, India’s most popular cricketer, plays the size of the downward movement in returns is larger. So in fact the stock market surge today is not quite in line with the paper’s conclusions. But, for once, a masterly performance by Tendulkar the “Master Blaster” has coincided with an India win!! So the correlation is permitted some poetic licence.